So this year will be a prime year. What to wish, then ? A sea of love and love of the sea. End of holidays at Guétary. Imagine two skippers on a boat (IMOCA Open 60), fighting alongside other skippers as they compete in a crazy race of… 46,300 km ! A true round the world, non-stop sailing tour, with the start and finish line in the same place – Barcelona ! The Barcelona World Race 2010 is the second edition of an excitingly mad race that takes place every four years. The first was held in 2007/08, the third will (logically) take place in 2014. To know more about the previous edition, click here. Absolutely unique the Barcelona World Race is the only round the world yacht race that is double-handed (two co-skippers per boat) in which no external assistance is permitted or there is a penalty. The race is organized by the Fundació Navegació Oceànica in Barcelona, and starts on 31st December 2010 at 13 h just in front of the Hotel W in the port of Barcelona. The arrival is estimated for the end of March 2011! The departure and arrival will be in Barcelona with three different points of passage at the three Capes (Good Hope, Leeuwin, Horn) and the Cook Strait. The approximate length of the course is 25,000 nautical miles or for non-sailing minds, 46,300 km ! Once again this year the best skippers in the world will line up at the start for the Barcelona World Race. Jeanne Baret didn't set out to be the first woman to circumnavigate the globe. When she stepped onboard the Etoile in 1766, she was looking for plants. Her lover, Philibert Commerson, was a well-known botanist at the time and had been selected to be part of French explorer Louis Antoine de Bougainville's round-the-world expedition from 1766-69. 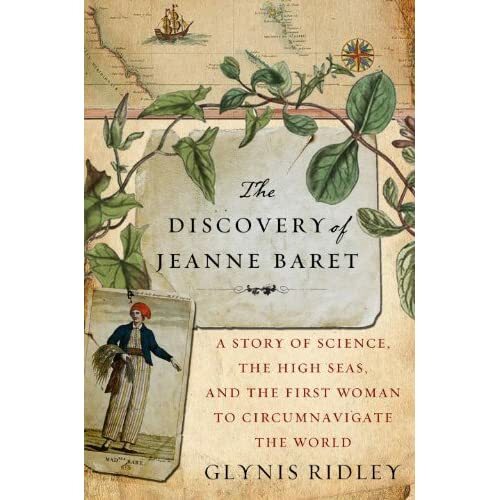 Glynis Ridley, author of The Discovery of Jeanne Baret: A Story of Science, the High Seas, and the First Woman to Circumnavigate the Globe, says Baret would have been the obvious choice to serve as Commerson's assistant on the Etoile's journey, except for one thing. "A French Royal ordinance forbade women being on French Navy ships," Ridley tells Weekend All Things Considered host Guy Raz. A little theater was necessary. "The couple formulated a plan for Baret to disguise herself as a young man [and] offer herself as his assistant on the dockside." After Commerson "accepted" Baret into his service, the couple was able to keep their secret from the crew of over 100 men for some time. Baret's real identity was cruelly revealed, however. The commander of the expedition claims it happened when the Etoile landed on the island of Tahiti. "Bougainville said that a group of Tahitian men surrounded Baret and immediately identified her as a woman," Ridley says. "Because she was worried about what might happen, she supposedly revealed her true identity so that her countrymen, the French, could save her from what she took to be an imminent sexual assault." But after poring over the diaries of crew members, Ridley doesn't believe Bougainville's tale. "That story is peculiar to Bougainville's journal," Ridley says. "In fact, three other members of the crew contradict this story and say that Baret was, in fact, brutally exposed." According to the other journals, Baret was discovered and gang-raped by her crewmates in Papua New Guinea. Baret very likely discovered many plants on the expedition, Ridley says, most notably the bougainvillea plant, named for the Etoile's commander. The plant named after Baret, however, has since shed her name. Commerson identified the plant while botanizing with Baret in Madagascar and named the genus Baretia. "The thing about Baretia is that an individual plant may contain a contradictory set of leaves," Ridley says. "Some are oblong, some are rather more square, and some are fairly irregular." "[Commerson] thought that this was a nice summation of Baret herself, since she united a lot of opposites," Ridley says. In addition to being a woman wearing man's clothes, "she was a working-class woman who traveled ... further than any aristocrat." If you look up the genus Baretia today, however, you won't find much. The genus has been reclassified under the name Turraea. Ridley hopes her book might bring Baret's name back from the past. "It would be wonderful if, as a result of the book, somebody wants to name something after Baret again," she says. "I think that would be a nice tribute." A couple of them are from San Francisco. Find them. The Satellite Collection is a series of six digital prints that Jenny Odell made by collaging cut-out imagery from Google Satellite. Each one is printed and framed at 24"x24". The original Six Summits Project was to be realized by bringing a rowing boat to shore on different continents, climb the tallest peak there, and row to the next. All would be self-propelled meaning that Erden Eruc would be the one propelling any means of transportation. Halfway out, Erden realized that his quest would not live up to his rules. What would you do? For Erden, it was back to square one. This time, he would instead bicycle across the continents and row the oceans in between. He could stop on each leg and go home for a while, but would have to return to the exact spot where he had left off - down to the very yard of it. Erden's second quest for a human powered circumnavigation kicked off north of San Francisco in July 2007, and this is what led to his beaching on Madagascar last month, after 137 solo rowing days. While on the Mascarene Basin he had crossed the meridian circle of his start at Bodega Bay -- a symbolic halfway point. ExplorersWeb's awards don't usually go to explorers in the midst of their challenge. Erden's case has called for an exception twice, due to specific parts that broke a number of records all in themselves. Except for castaways, few people have it in them to leave Australia in a small rowing boat and head out in to the vast Indian Ocean. For Erden, it was just another day at the office. After all, he had already spent 312 days to row 9500 nautical miles non-stop across the Pacific. Only Jim Shekhdar had rowed longer there (10600 NM) and together with Peter Bird's 8700 NM, no one has been close to such distances on the Pacific before or since. The Pacific row rendered Erden a 2008 ExWeb Award. In the middle of nowhere, Erden's small boat was slowly transforming into a Noah's Ark. Birds hung out in the crammed spaces, a faithful flock of fish trailed the boat. In Erden's live pictures for the first time; not only his, but also Bird's and Shekhdar's Pacific fates, came alive. After the Pacific, Erden Eruc crossed Papua New Guinea on foot and in a kayak. A sea kayak carried him to Cooktown, in Australia, from where Erden bicycled 7,780km to Perth. En route he summited Mt Kosciusko on April 10. Now Erden was ready for his next stage on the Indian Ocean. This time, another crux lay ahead: Pirates. "During the crossing near Nazareth Bank short of 060E longitude, when I received the word that a fishing vessel had been hijacked near Ile Tromelin east of Madagascar on the Mascarene Basin, I asked the Ocean Rowing Society to freeze my public tracking page, and also I stopped posting my dispatch locations." "The beacon was never turned off. The tracking was instead resumed on a private page by the ORS which was made available to my team, to my sponsors and to Tom Sjogren (HumanEdgeTech). This was a precaution against the threat of piracy to maintain a low profile." Somali pirates were not responsible for Erden's final beaching; the cyclone season was. The Indian Ocean is infamous for its relentless storms and it was one such that made Erden abort his final and nail-biting fight to achieve the first solo row from mainland Australia to mainland Africa. Following an astonishing 137 days out at sea non-stop, on November 26 Erden hauled his rowing boat up on the island of Madagascar. Erden is now second only to Peter Bird to have spent the longest time out at sea in a rowing boat (Bird spent 937 days and died on the voyage). He is the first to row three oceans solo, and his latest row is by far the longest row yet over the Indian Ocean. Erden plans to continue his row as soon as the storm season is over. Through his rowing, mountain climbing and biking, Erden Eruc intends to eventually make his way back to San Francisco. I will not lose you." Erden's voyage stays with us for the courage, determination, self reliance, and idealism it brought to the Spirit of Adventure in 2010. Peruvian fisherman named El Niño (Spanish for “the boy child”) after the Christ child because the climate phenomenon usually shows up around Christmastime. But its counterpart, La Niña, is the gift giver, bringing cold, nutrient-rich water to the equatorial Pacific off South America. Those nutrients are a boon to marine life, supporting a larger fish population and increasing the fishermen's catch. Fishermen might expect a good year ahead, as a strong La Niña is now dominating the Pacific Ocean. “This is one of the strongest La Niña events in the past half century, and will likely persist into the northern hemisphere summer,” says Bill Patzert, an oceanographer and climatologist at NASA’s Jet Propulsion Laboratory. La Niña’s cold water signal is strong in the top two images. The left image shows ocean surface temperatures on December 15, 2010, as measured by the Advanced Microwave Scanning Radiometer for EOS (AMSR-E) on NASA’s Aqua satellite. In December 2010, sea surface temperatures were colder than average across the equatorial Pacific. The right image depicts the heat content of the ocean surface between December 14 and 16, 2010, as observed by the U.S.-French Ocean Surface Topography Mission (OSTM)/Jason-2 satellite. Water expands as it warms, so warmer water has a higher surface elevation than cooler water. The blue valley streaking across the middle of the sea surface height image is the signature of La Niña. The intensity of the cold water and the depth and extent of the valley point to an intense event. Like El Niño, La Niña comes from changes in both the ocean and the atmosphere. High pressure usually dominates the atmosphere over the eastern Pacific, while low pressure tends to reign in the west. The pressure difference creates the trade winds, which blow surface water across the equatorial Pacific to a pool of warm water in the west. Cooler deep water wells up to replace the surface water. During La Niña events, the pressure difference and the resulting trade winds are stronger. The more intense winds push more water west, where it builds up north of Australia. Meanwhile, more cold water wells up in the central and eastern Pacific. La Niña occurs only when both the ocean and the atmosphere change together, and in 2010, they have, says oceanographer David Adamec of NASA’s Goddard Space Flight Center. The unusual ocean temperatures and imbalance in air pressures alter weather patterns across the world. This image shows some of the unusual weather La Niña brought in December 2010, as observed by the Tropical Rainfall Measuring Mission (TRMM) between November 23 and December 23, 2010. The image shows rainfall totals compared to average rainfall for the period, with above-average rain in blue and less-than-average rainfall in brown. “Weather effects are strong in the western Pacific,” says Adamec. “Australia is flooding in many areas.” La Niña rainfall patterns are also evident in the stark horseshoe-shaped region of unusually dry weather in the central Pacific. La Niña typically affects weather patterns in North America beginning in January. “For ‘normal’ effects in the U.S., look for cold in the Upper Plains, dry and warm weather in California, dry weather in the southeast, especially Florida, and unusually soggy weather in the Northwest,“ says Adamec. Because such a wide swath of the Pacific is cold, La Niña tends to keep a lid on global temperatures. 2010, however, was still shaping up to be the hottest year on record in spite of La Niña, according to scientists from NASA Goddard Institute for Space Studies. Climate Prediction Center/NCEP. (2010, December 20). ENSO cycle: Recent evolution, current status and predictions. National Oceanic and Atmospheric Administration. Hansen, J., Ruedy, R. Sato, M., and Lo, K. (2010, December 13). 2010—Global temperature and Europe’s frigid air. NASA Goddard Institute for Space Studies. Accessed December 23, 2010. NASA Earth Observatory. (n.d.) La Niña. Accessed December 21, 2010.